Important: The Tableau licensing service was moved to a new data center on October 6, 2018. This means that any environments that required special configuration (static IP safe listing for example) to access licensing.tableau.com or licensing.tableausoftware.com will need to be updated before you can activate, refresh, or deactivate a Tableau product key. For more information, see Tableau Community. Tableau Desktop and Tableau Prep can be licensed under a term license model. Term licenses, also known as subscription licenses, allow you to use and update Tableau Desktop and Tableau Prep for a specified period of time. Term licenses must be renewed to continue providing uninterrupted service. You can continuously renew the term license as each specified period expires. If you don't renew your term license and the term expires, Tableau will stop working and you will no longer have access to the software. Note: Trial licenses for Tableau Desktop or Tableau Prep expire after a set period of time, usually 14 days. After the trial period expires, you'll need to purchase a license to continue using the product. After you install Tableau Desktop or Tableau Prep open the application and then navigate to Help > Manage Product Keys from the top menu to see information about the type of license you have and when it expires. You can also activate or deactivate a product key or refresh a maintenance product key from this dialog. Note: Tableau offers term licenses that provide a range of capabilities. The type of license that you have is displayed in the Product field. For more information about the different type of user-based licenses that are available, see User-based licenses in the Tableau Server help. Existing Tableau Desktop users may have a perpetual (permanent) license. Perpetual licenses don't expire. However, to get access to product updates and technical support you must purchase Support and Maintenance services. These services must be renewed to continue receiving the service. Perpetual (permanent) licenses are no longer available for Tableau Desktop. Refresh (Tableau Desktop only): Click the Refresh button to refresh a maintenance license that is expiring, then close and restart Tableau Desktop. If the Maintenance Expires date doesn't update, check with your license administrator as the key or maintenance agreement may have changed. To refresh a maintenance key from the command line see Refresh the product key in the Tableau Desktop and Tableau Prep Deployment guide. Deactivate: Select a product key in the list then click Deactivate to deactivate the product key. Deactivate a product key if you need to move the product key to another computer or when you no longer need the product key on this computer. For more information about deactivating a product key, see Move or Deactivate Product Keys in the Tableau Desktop and Tableau Prep Deployment guide. Activate: After Tableau Desktop or Tableau Prep is installed, click Activate to open the activation dialog and enter your product key. If you get an error and can't activate Tableau Desktop or Tableau Prep using your product key, contact Tableau Support. For more information about activating a product key, see Activate Tableau Desktop or Activate and Register Tableau Prep in the Tableau Desktop and Tableau Prep Deployment guide. If you want to track and view license usage and expiration data for Tableau Desktop in Tableau Server you must configure Tableau Desktop to send license data to Tableau Server on a set interval, and then enable reporting on Tableau Server. Desktop License Usage: This report lets server administrators see usage data for Tableau Desktop licenses in your organization. Desktop License Expiration: This report gives server administrators information about which Tableau Desktop licenses in your organization have expired or need maintenance renewal. 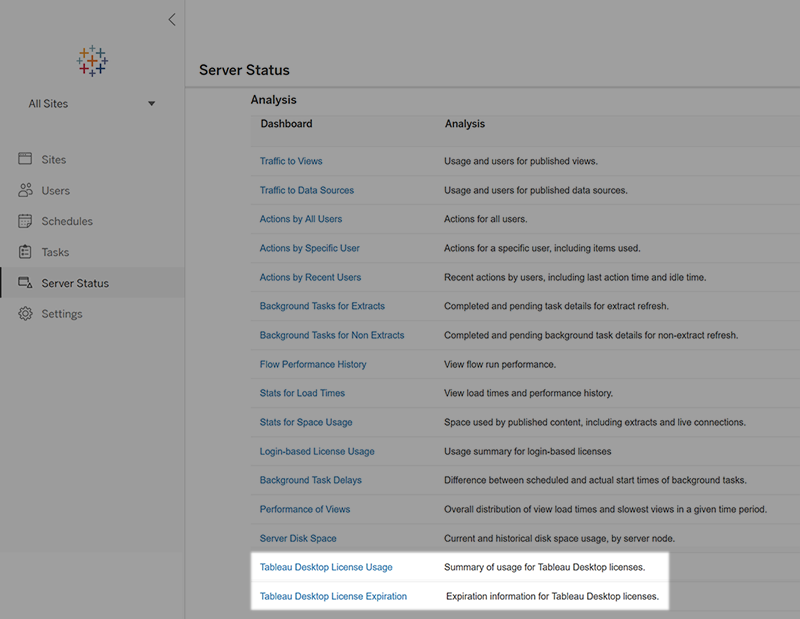 If Tableau Desktop and Tableau Server are configured for license reporting, when signed in to Tableau Server as an Administrator, you will see these two reports listed in the Status tab in the Analysis section. If you don't see these reports listed, then Tableau Desktop and Tableau Server may not be configured for Tableau Desktop usage reporting. For information about how to configure Tableau Desktop and Tableau Server for usage reporting, see Manage Tableau Desktop License Usage in the Tableau Desktop and Tableau Prep Deployment guide. To find your product key and activate Tableau Desktop see Install Tableau Desktop. To find your product key and activate Tableau Prep, see Install Tableau Prep. To deactivate a product key or move it to another computer, see Move or Deactivate Tableau Desktop. To learn more about product keys for non-persistent virtual desktops or for computers that are regularly re-imaged, see Configure Virtual Desktop Support.